Deb's Cup of Tea: So good. I am recommending this to all my chocolate loving friends. This bar is so good. I get it at Dominicks but if you have a Safeway near you, you should be able to get it. It's so smooth and creamy. 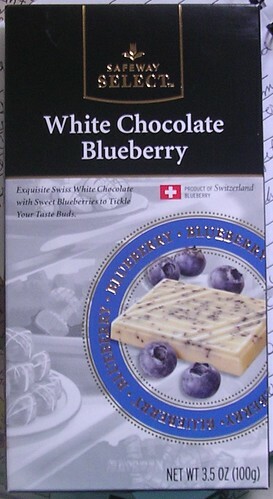 The mix of white chocolate and blueberries is just right so you aren't overpowered by either flavor. It was $2.69 for this bar. Heaven, just heaven. It doesn't replace M&M's with peanuts as my all time favorite chocolate item, but it's close.